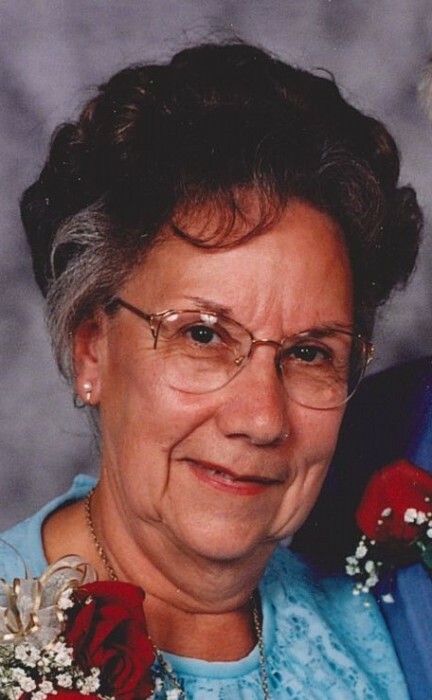 Janet “Jenny” L. Ebert died on 21 November 2018. She was born on 13 March 1929 to Hiram H. Cobourn, Jr., and Clara (Kauffeld) Cobourn. Janet was preceded in death by her four older siblings, William Cobourn, Esther Cobourn Wolber, Oscar Cobourn, and Joseph Cobourn. Janet grew up on the family farm in Richland Township, Marion County. When Janet was 16, her mother died unexpectedly while her father was recovering from a serious farm accident. Janet had worked as a secretary for ODOT for over 25 years and retired from there. She was a member of the American Legion Auxiliary Unit 97. Janet enjoyed baking, and many people will remember her for sharing her cookies and pies. She loved dogs and always enjoyed having one around the house. On 31 August 1947 Janet married Edward E. Ebert, who predeceased her on 2 October 2000. She is survived by two sons, Douglas E. (Heather) Ebert and David A. Ebert; and one grandchild, Jessica L. (Jeremy) Young. Janet was very fond of music and sang in the St. John’s Lutheran (Windfall) choir during her younger years. She loved to sing around the house, with show tunes being a favorite. Janet worked at North Electric in Galion from 1967 to 1970, and was employed by the Ohio Department of Transportation in Delaware from 1970 to 1997. Janet was a member of St. Paul’s Lutheran Church at Cardington. Friends may call on Monday, November26, 2018 from 4:00 to 7:00pm at Gompf Funeral Home, 440 Center Street in Cardington. The funeral service will be held Tuesday, November 27, 2018 at the funeral home at 11:00 am with Pastor Steve Dennis officiating. Following the service the burial will take place in the Glendale Cemetery. Those wishing to make a memorial contribution are asked to consider the Marion or Morrow County Humane Society or St. Paul Lutheran Church, 336 West Main Street, Cardington, Ohio 43315. Those wishing to share a memory of Janet or to express a condolence to the Ebert family may do so by visiting www.gompffh.com.